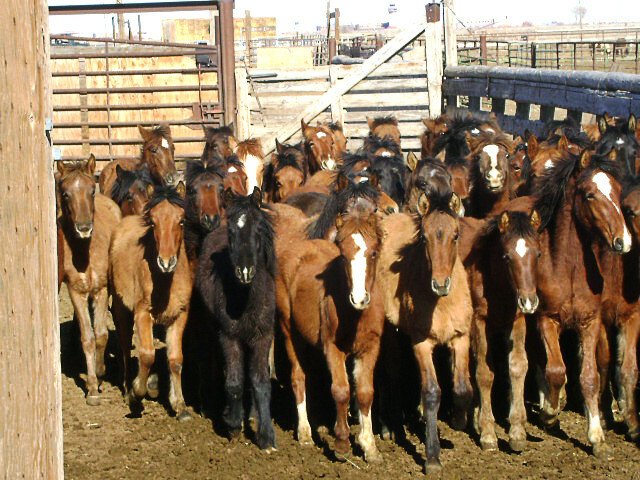 On Christmas Eve 2010, philanthropist and wild horse advocate Madeleine Pickens purchased 235 young wild mustangs from killbuyers who were set to ship them to a Canadian slaughterhouse. Days later, Jill Starr of Lifesavers successfully negotiated the release of 56 weanlings, pictured above, from a Northern Nevada native tribe. At long last Madeleine Pickens has wild horses for her ecosantuary, Mustang Monument. Last week the first of what Pickens hopes will eventually be thousands of mustangs living wild and free arrived at the sprawling ranch. The wild horses were original to Paiute tribal land and had been removed to cut numbers. I’m going to try my best to begin to let you know the power of Mustang Monument. Yesterday, we were blessed with the arrival of the first truckload of the Paiute mares and foals. These are the lucky mustangs that were rescued days from slaughter last December. During the unloading process there was such a huge windstorm that kicked up. Luckily the dust started to settle as the mares and foals were unloaded into a temporary round pen built with bales of hay. Then, we opened the gates to set them free in one vast, but still fenced off area. Literally hundreds of acres was theirs for the taking. As they saw the gate was open, they each were looking around, and very gently the lead mare floated forward with her mane and tail flowing in the wind. Each of the other horses happily followed her lead. They were all now at their forever home. The sight was truly overwhelming. Pickens hopes to make her eco-preserve a home for some of the wild horses gathered from the western rangelands by the Bureau of Land Management and held in long and short-term holding facilities. After years of being denied, Pickens has now applied to the BLM under its new policy that allows for public-private partnerships in the care of the horses. She believes the sanctuary will have tourism potential, benefiting the local community, and provide thousands of wild horses with a lifelong home in a rangeland environment. Watch the first horses to set hoof on Mustang Monument. Note: Please turn your speakers down before playing the video as the music is very loud! I received this notice of a new comment about the first horses at Madeline Pickens ranch and I see that my post actually made it there this time? I also received a test from you, but there was no place to reply or comment? This comment/reply is also different from the one I usually get? Thanks Madeleine for ALL YOU DO for these special animals. YOU need to run the BLM. I am having difficulty doing a reply comment. When I submit it still comes back to me for the confirmation, but there is some sort of advertisment over it that I cannot mark the apply box. However, I am receiving notices of other folks comments, but mine do not show up under “see all comments” ??? What a wonderful, beautiful sight!!! God Bless you and thank you Mrs. Pickens. This is some of the best news possible. Now I hope the horses in the holding pens can be released.